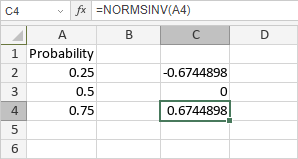 The NORMSINV function is one of the statistical functions. It is used to return the inverse of the standard normal cumulative distribution. where probability is a numeric value greater than 0 but less than 1 entered manually or included into the cell you make reference to.